Belly Binding is an ancient Malaysian method of wrapping the postpartum mother’s abdomen in a long narrow piece of muslin or light weight cloth. Wrapping the belly is an effective and important part of a mother’s recovery that aids the body to shrink and recover in a shorter time period, normally 6 to 8 weeks. A sacred belly wrap provides a mother’s postpartum body with 360 degree support to assist the abdominal wall muscle retraction, improve posture, stabilize loosened ligaments, and provide support to the torso while vital organs return to their pre-pregnancy size and position. When and how long do I wrap? Women should be wrapped as soon they can after birth, ideally on day five postpartum. 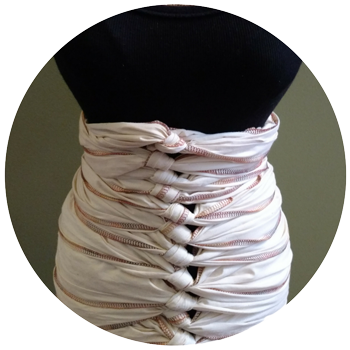 The belly bind should be worn daily for 10-12 hours a day for at least 40 days or longer. Often women who use a belly bind after birth return to their own pre-pregnancy size in 6-8 weeks. After a cesarean birth women should wait at least 6 weeks until the incision is mostly healed before they are wrapped. We offer in-home Belly Binding Instruction. Our certified Belly Binder will come to your home for step-by-step personal instruction within a 40 mile radius of Avon Lake. 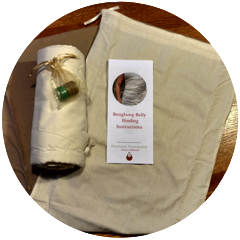 We also offer DIY Belly Binding Kits that include: a case for your bind that doubles as an underlay, the natural muslin bind with hemmed edges, step-by-step instructions with a link to online tutorial, a sample of Scentsable Health’s Beyond the Bump Postpartum Salve.